Photo Source: Richard Posner of the 7th U.S. Circuit Court of Appeals in Chicago. John Gress/Reuters /Landov. In a recent interview with NPR, the renowned conservative legal thinker Federal Judge Richard Posner, who is a 1981 President Ronald Reagan appointee to the 7th U.S. Court of Appeals, spoke candidly about the crisis of the new Republican Party and conservative thinking in America. Because if you put [yourself] in his position ... what’s he supposed to think? That he finds his allies to be a bunch of crackpots? Does that help the conservative movement? I mean, what would you do if you were Roberts? All the sudden you find out that the people you thought were your friends have turned against you, they despise you, they mistreat you, they leak to the press. What do you do? Do you become more conservative? Or do you say, 'What am I doing with this crowd of lunatics?' Right? Maybe you have to re-examine your position. All of this, according to his NPR interview, led Judge Posner to express exasperation with the modern Republican Party, while also confessing that he has become “less conservative” as a result. For those unaware, Judge Posner is also a senior lecturer at the University of Chicago Law School, and has authored dozens of books on law and economics. In 2000, the Journal of Legal Studies identified him as the most-cited legal scholar of the 20th century. Nina Totenberg, Federal Judge Richard Posner: The GOP Has Made Me Less Conservative, NPR, July 8, 2012. Ashley Portero, Reagan-Appointed Judge Richard Posner Calls ‘Goofy’ Republicans A ‘Crowd of Lunatics’, International Business Times, July 6, 2012. Richard A. Posner, Supreme Court Year in Review, Slate, June 27, 2012. Photo Source: (FILES) In a file photo taken on on March 9, 2012, Bo Xilai, Communist Party secretary of Chongqing attends the third plenary session of of the National People's Congress’s (NPC) annual session at the Great Hall of the People in Beijing. (LIU JIN/AFP/Getty Images) via Gu Kailai, Bo Xilai’s Wife, Has Confessed To Neil Heywood Killing: Japanese Newspaper, Huffington Post, June 22, 2012. In the continuing drama of the mystery surrounding the murder of Neil Heywood, a Japanese Newspaper, the The Asahi Shimbun, reported that Gu Kailai, the wife of Bo Xilai, confessed to the Neil Heywood killing. In April 2012, it was earlier reported that Heywood was poisoned after threatening to expose Gu’s money moves--a parallel finding to the Japanese newspaper’s Friday report. Source: Gu Kailai, Bo Xilai’s Wife, Has Confessed To Neil Heywood Killing: Japanese Newspaper, Huffington Post, June 22, 2012. Photo Source: African expatriates protesting the deaf of a fellow expatriate in the Yuexiu district of Guangzhou, PRC; 广州一外籍男子与人打斗后死亡 外国人围聚派出所堵路, Ifeng.com News, June 19, 2012. Today, in Guangzhou, China, there was a clash between African expatriates and Chinese police officers in the Yuexiu district. After reading the article, I was reminded of both an ongoing immigration crisis in China, especially concerning expats from some African countries in Guangzhou, and occasional reports of abuse of some prisoners in police custody in different parts of China. The standoff involved a dispute about a fare for a taxi (by motorcycle) between a Chinese citizen and an African expat. The police officer(s) took both to the local Yuexiu police station, and reportedly the African expat collapsed and ultimately died. Yuexiu police officers did dispatch for medical assistance to help this man. Photo Source: African expatriates protesting the deaf of a fellow expatriate in the Yuexiu district of Guangzhou, PRC, as one protester is shown holding up a sign that reads, “Give us the body”; 广州一外籍男子与人打斗后死亡 外国人围聚派出所堵路, Ifeng.com News, June 19, 2012. Otherwise, the lack of information about what exactly occurred inside the Yuexiu police station notwithstanding, it is difficult to imagine that some sort of police abuse arose simply out of a dispute about the fare for a taxi. Finally, one reasonably suspects that the investigation of this incident will more fully explain the cause of death. All Rights Reserved M. Ulric Killion, 2012. Photo Source: “Trade and aid are expected to top discussions during the China-Africa Summit...”; “Export-Import Bank of China extended $12.5 billion more in loans to sub-Saharan Africa in the past decade than the World Bank, Fitch Ratings said. State-owned EXIM lent about $67.2 billion to the world’s poorest region between 2001 and 2010 compared with the World Bank’s $54.7 billion…,” Mike Cohen, China’s EXIM Lends More to Sub-Sahara Africa Than World Bank, Bloomberg, December 28, 2011; cnsphoto/defensepak.forum. The U.S. Congress is presently struggling with the issue of whether to renew the charter of the Export-Import Bank (Ex-Im Bank). Since its inception in 1934, the issue of renewing the charter of the Ex-Im Bank has hardly been a controversial one, as the U.S. Congress routinely and without controversy would renew its charter. This year, however, the renewal issue is causing a controversy, though surprisingly not along partisan lines. Rather, the center of the controversy is a division within the Republican Party. According to the Associated Press, “In the House, Republicans are torn between their business allies who are strong Ex-Im backers and conservative groups which say the agency should be eliminated.” This controversy and division within the Republican Party also parallels diverging positions in the aircraft industry or trade in large civil aircraft, as seen in the difference between The Boeing Company (Boeing), which is a beneficiary of Ex-Im Bank financing, and Delta Air Lines that maintains Ex-Im Bank financing adversely affects its bottom line. For those unaware, the Ex-Im Bank generally serves the critical role of helping to finance American companies’ overseas sales such as trade in large civil aircraft. In terms of global trade, the complaints of Delta Air Lines notwithstanding, for the U.S. economy, the renewal of the bank’s charter presents an economic imperative that will ultimately foster economic growth, productivity in manufacturing, jobs, and other positive amenities. BCC expects that 10 per cent – or $10bn – of the financing for the 2012 deliveries will come from airlines and lessors tapping capital markets, mainly though bond rather than equity issuance. BCC estimates only 5 per cent of financing will have come from capital markets in 2011. Meanwhile, BCC expects commercial bank lending for aircraft purchases to shrink as a proportion of aircraft financing, from 25 per cent in 2011 to 21 per cent in 2012. The absolute amount is due to increase slightly, from $19bn in 2011 to $20bn in 2012. The benefits of an export-import bank, however, are subject to the world trading system and its rules, such as the World Trade Organization (WTO), Agreement on Subsidies and Countervailing Measures (SCM Agreement). It is notably that both Boeing and the EU’s Airbus have been subject to charges of violating the WTO’s SCM agreement, by receiving unfair subsidies. For example, in March 2012, the WTO upheld a ruling that Boeing received “at least” $5.3 billion of unfair subsidies between 1989 and 2006, while also agreeing with Airbus that the effect of these subsidies or financial support was greater than their face value, as measurable in light of their “particularly pervasive” nature. There is also the pending WTO case against Airbus and its unfair subsidies. In April 2012, a WTO dispute panel agreed to further examine the EU’s compliance in the Airbus case, including an issue of new unfair subsidies. While aircraft industry trending leans toward leasing rather than buying large civil aircraft, there are, however, exceptions to the rule such as the Development Bank of Japan (DBJ or Kabushiki-gaisha Nippon-seisaku-toshi-ginko), which is not pulling back from aircraft financing as seen with some European banks, and a growing participation in the market by some insurance companies. Then there is the often overlooked potential role of the Ex-Im Bank in both international financing and international diplomacy. An exemplary example of such a role is the case of China and its export-import bank, which is the Export Import Bank of China (China Eximbank or Zhongguo Jinchukou Yinhang). China’s creative international financing employs in many parts of the world, such as the regions of the Asia-Pacific, Latin America, Eastern Europe, and Africa. In this respect, and demonstrating a broader importance of export-import banks, it may simply be an issue of a Beijing-form of creative international financing rather than a familiar Washington-form of capitalism. In the end, a crisis looms because the charter of the Ex-Im Bank is set to expire at the end of this month, and there is also the issue of the Ex-Im Bank’s statutory lending cap of $100 billion. One reasonably suspects that the U.S. Congress will renew the Ex-Im Bank’s charter, and attempt to adjust its lending cap. This is because the role of the Ex-Im Bank rightly enjoys bi-partisan support, as it also actually aids in the promotion of competitiveness in manufacturing, economic growth, and world trade. Jim Abrams, Ex-Im’s Future Caught Up in Congressional Fight, Associated Press, May 7, 2012. Andrew Parker, Banks withdraw from aircraft financing, Financial Times, December 6, 2011. Cathy Buyck, WTO upholds Boeing subsidies ruling: Airbus & Boeing both claim victory, Air Transport World, March 13, 2012. World Trade Organization, Dispute Settlement - Dispute panel to examine EU compliance in Airbus case, WTO News, April 13, 2012. World Trade Organization, SUBSIDIES AND COUNTERVAILING MEASURES: OVERVIEW - Agreement on Subsidies and Countervailing Measures (“SCM Agreement”); May 7, 2012. M. Ulric Killion, Post-global Financial crisis: The measure of the “Beijing consensus” as a variety of capitalisms, MPRA Paper 26382, University Library of Munich, Germany, 2010. Photo Source: “A federal court in Texas ruled to stop a new law on Monday that excluded Planned Parenthood from the Texas Women's Health Program, which serves about 130,000 low-income women in the state. U.S. District Judge Lee Yeakel ruled that the law was unconstitutional. . . After HHS cut off Texas' Medicaid money, Texas Gov. Rick Perry (R) promised to make up for the $30 million funding gap and pay for the Women's Health Program with the state's own money. But conservative Texas officials have suggested that they would rather end the entire program than allow Planned Parenthood to participate in it,” Laura Bassett, Texas Planned Parenthood Defunding Halted By Federal Judge, Huffington Post, April 30, 2012. Getty file. — Mohamed Sid Ahmed, The Kagan Thesis (3) - Beyond Fukuyama and Huntington?, Al-Ahram Weekly On-Line No. 602, September 11, 2002. A primary goal of their spring meeting was two-fold: Closing the gap on social safety nets, and financial inclusion. Photo Source: “The Spring Meetings and related events April 16 to 22 highlighted safety nets as a way to protect people from crises and to help “close the gap” in nutrition, gender equity, income and access to jobs”. . . Close the Gap: Safety Nets Work on April 18 brought together high-ranking officials from the Philippines and Brazil, development experts, and basketball stars to discuss, in a live webcast, how safety nets have changed lives in middle and low income countries, and why it’s important for governments to expand their investments in these programs,” Donna Barne, At Spring Meetings, Support for Safety Nets and a More Modern Bank, Blogs.worldbank.org, April 23, 2012. The Spring Meetings and related events April 16 to 22 highlighted safety nets as a way to protect people from crises and to help “close the gap” in nutrition, gender equity, income and access to jobs. The Development Committee also called on the Bank to continue to look for solutions to the problems of fragile and conflict-affected states, food insecurity and malnutrition. High and volatile food prices are preventing millions of people from escaping poverty and hunger, according to the Bank’s latest Global Monitoring Report, released at the meetings. Close the Gap: Safety Nets Work on April 18 brought together high-ranking officials from the Philippines and Brazil, development experts, and basketball stars to discuss, in a live webcast, how safety nets have changed lives in middle and low income countries, and why it’s important for governments to expand their investments in these programs. Some 80% of developing countries plan to create or improve safety nets, and this form of social protection is a critical component of the Bank’s new, 10-year Social Protection and Labor Strategy, released April 18. In terms of the Republican Party, one reasonably suspects that it supports the goals of the World Bank, and impliedly would support the goal of protecting “people from crises and to help “close the gap” in nutrition, gender equity, income and access to jobs; to name only a few of the issues and programs that they would generally characterize as entitlement programs or safety nets. In other words, one suspects that the Republican Party probably supports this worthy effort to provide social safety nets for those living in foreign countries. This is because the Republican Party has long taken pride in economic liberalization or globalization, which (commencing in the 1970s) the antagonists to globalization began to associate with the name of neo-liberalism. In the 1970s and 1980’s, the concept of neo-liberalism (or economic liberalism) begins to emerge with the debt crises in developing countries. In the 1970s, and pursuant to growing interests in international economics, the antagonists of economic liberalism and globalization commence usage of the nomenclature of neo-liberal, while those supporters subscribing to its tenants would rather prefer to themselves as simply libertarians, free marketers or conservatives. Neo-liberalism is also the name often given to the political-economic restructuring or reform programs proposed for developing countries by developed country economists, the IMF and World Bank, and some refer to the structural adjustment programs of the BWIs as simply neo-liberal reforms. A criticism of neo-liberalism is that it arguably extends the same individual rights to transnational corporations and banks, and moves the rights of property from the status of a social right to that of a fundamental right. The complaint being that Western neo-liberalism treats transnational banks and corporate entities as equal, for instance, to a small farmer in China. The antagonists complain that while neo-liberalism grants significantly more freedom to corporate entities, a problem of neo-liberalism is that, historically, it does not extend the same freedoms to indigents and working people. What should also be understood is that neo-liberalism necessitates neo-liberal policies and neo-liberal reform, because neo-liberal reforms, generally, encompass privatization, free markets, de-regulation, austerity and comparative advantage. The problem of this earlier version of neo-liberalism, and its attendant neo-liberal policies, is that harsh criticism alongside debt crises in the 1980s actually necessitated a shift to more people-friendly policies; thereby, the birth of the idea of a more “pragmatic” neo-liberalism. Photo Source; “These are only a few of the examples of education marginalization that occurs in every country in the world. These types of marginalization could only be addressed with policies that tackle underlying issues such as social inequity, gender disparity, and ethnic/linguistic disadvantages,” Global Education and Economic Downturn, Globalization 101, The Levin Institute - The State University of New York, March 14, 2011; Uganda – © UNESCO/Marc Hofer. In other words, the previously mentioned tenants of neo-liberalism, who would rather prefer to themselves as libertarians, free marketers or conservatives, arguably have few qualms about protecting the social safety nets of other countries. A problem is that in the context of the American people caught in the claws and fangs of globalization and its failings (i.e., the 2008 subprime mortgage crisis or global financial crisis), the Republican Party is showing little, if any, compassion for their fellow Americans, such as middle-class Americans and “very poor” Americans. While the Republican Party, libertarians, free marketers or conservatives are clearly advocates of the earlier mentioned neo-liberal reforms, they admittedly might find the policies of protecting entitlements or social safety nets of other countries as objectionable. This may also be one of the objections of the Republican Party to President Obama’s recent appointment of Jim Yong Kim, Dartmouth president, to head the World Bank. The seeming target of the new Republican Party and its extremisms on many social issues are vested rights, entitlements and/or social safety nets; such as women’s rights, the right to equal pay for women, fair employment rights, the Lily Ledbetter Fair Pay Act, the Affordable Care Act, abortion rights, contraception, the Blunt Amendment, the Family and Medical Leave Act, Planned Parenthood, birth control, and other issues that affect the lives of women, self-deportation of immigrants, education, feeding and housing the “very poor”, and a host of other social concerns. It is admittedly also possible that the Republican Party may try to move against these new goals of the World Bank by following suit of Texas Governor Rick Perry (R), which means an attempt to terminate these social safety nets by defunding the World Bank, or simply, cutting off U.S. funds for the World Bank. This, however, is mere speculation, because one also suspects that they will not object to the World Bank bolstering these social safety nets. Granted, they would not be doing so out of altruism or sympathy for poor people, because there is an economic benefit that arises from doing so. This is because developing countries ultimately offer the prize of comparative advantage (i.e., land and/or labor endowments, or simply, cheap land and low wages or cheap non-union labor). In the end, the new Republican Party and its extremisms will eventually find itself far afield of both mainstream America and the world at large. In a post-Lehman world, for the majority of Americans, they are determined to demonstrate their lack of compassion for those now struggling for survival. Photo Source: Paul Ryan gave speech on federal budget at Georgetown University; Power Panel: Child Labor and Catholics v. Paul Ryan. Young Turks, April 30, 2012. A week after Ryan’s boast, the bishops sent letters to Congress saying that the Ryan budget, passed by the House, “fails to meet” the moral criteria of the Church, namely its view that any budget should help “the least of these” as the Christian Bible requires: the poor, the hungry, the homeless, the jobless. “A just spending bill cannot rely on disproportionate cuts in essential services to poor and vulnerable persons,” the bishops wrote. Photo and Video Source: “The Truth About GOP Hero Ayn Rand,” Dave Johnson, Concern Over Republican Embrace of the Ayn Rand Poison, Huffington Post, June 10, 2011; See the Video here. Moreover, one would even venture to say that at some point the Republican Party’s extremisms (i.e., the war against women, the war on the poor, the war on immigrants, the war on health care, etc) will dissipate, because the citizenry that now supports its extremisms will eventually withhold their acclamation. According to Pew, they are both anti-government and anti-big business. They are social conservatives with a deep antipathy to illegal immigration. But they are also the most financially insecure of all the groups—among Democrats and Independents as well as Republicans—and perhaps for that reason, less averse to a government that extends a helping hand to the downtrodden. For the most part, they are whites with no more than a high school education. Many report personal or family struggles with unemployment. A better example of this tragedy or maybe even an oxymoron in the new Republican ideology might well be the real life example and experiences of Ayn Rand. This is because Paul Ryan’s mentor or guide spent most of her adult life railing against the evils of federal insurance. In reality, however, and later in life and during a difficult period of money problems and health issues, both Rand and her husband reportedly did receive social security payments and Medicare payments. In other words, the social safety net was there for both Ayn Rand and her husband in their time of need, as it has always been for many years now to help others – the poor, the hungry, the homeless, the jobless. For now, however, and as a courtesy of the Republican Party and its ideology and extremisms, America’s social safety net teeters on cliff edge. With that being sad, I will leave the readers of this article to answer for themselves the question of whether altruism, democracy and Christianity are evil? 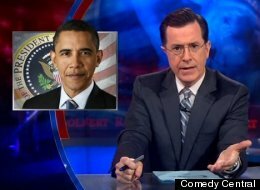 You know that the 2012 presidential race is heating up when Stephen Colbert is willing to defend his former best friend Jimmy Fallon for hosting President Obama on his show. >>See Colbert Takes on Fox News Video here. On Thursday night, Colbert had some fun with Fox News' reaction to President Obama appearing on “Late Night with Jimmy Fallon” to do some slow jammin' of the news. And by “had some fun,” Colbert essentially let the stable of usual suspects -- Megyn Kelly, Gretchen Carlson, Bill O'Reilly -- speak for themselves, and rolled footage of the Fox News pundits bloviating about how dare the President go on a comedy show during an election year. Even though Romney appeared on Letterman, and George W. Bush had no hesitation in making fun of himself for going to war while in office. Photo and Video: President Obama’s “Slow Jam The News” on “Late Night with Jimmy Fallon”; >>See the (Jimmy Fallon)Video here. But no, Obama is truly the culprit for appearing exceptionally charming on a show viewed by millions of young people. As Colbert noted, youth voters will be forced to face the question: “Who do I like: The guy I like, or the guy I don't like?”. . . .
Photo Source: “It was also shamelessly maudlin, mendacious in the extreme, and otherwise completely of a piece with the entire campaign that has been waged by the man who delivered it in triumph last night”, Charles P. Pierce, Game Over: Mitt Romney's Big Night, Esquire magazine, April 25, 2012. On April 24, 2012, Willard Mitt Romney (“Rmoney”) gave a sort of pre-ordination speech that addressed his ascendancy to the GOP’s 2012 candidate for the office of U.S. president. Never mind Newt Gingrich, though now re-assessing his campaign, and Ron Paul, who is still challenging his ascendancy, Rmoney took the crown and set it upon his head, as in the coronation of a king. For this reason, and countless others, the 2012 GOP primary race will go down in history as the worst kind of political circus, the worst variety of forked tongues, the most bloodletting of political campaigns, and a distinguishable extremism that will haunt the GOP for years to come. In other words, when it comes time to vote in November, one would certainly have to share some of their extremisms or extreme positions in order to the punch the GOP ticket for POTUS. He’s getting better at being shameless. Believe that. In retrospect, it's hard to believe anyone ever took seriously the notion that Romney was not inevitable. With Obamacare fully installed, government will come to control half the economy, and we will have effectively ceased to be a free-enterprise society. This president is putting us on a path where our lives will be ruled by bureaucrats and boards, commissions and czars. He's asking us to accept that Washington knows best — and can provide all. We will have effectively ceased to be a free-enterprise society. That passage is pure Nixon, when it is not pure Glenn Beck. (We’re back to “czars” again?) Massachusetts did not “cease to be a free-enterprise society” when he passed his health-care plan there. (He can look at my insurance bill if he’s still unclear about that.) But because he has rolled so powerfully to the nomination, he can say pretty much anything at this point because the power of his campaign now far outweighs the truth of his words. There once again is a rising sense of inevitability about him, and he is most comfortable with that. There is nothing light or casual about what he's doing. He sees a property worth buying, and he’s in it for the kill. In the interim, the GOP right wing nuts leave an American populace with the choice of their extremism versus non-extreme ideas and policies. For instance, the right wing nuts, in perpetuating a falsehood, deny that President Obama is a Christian, which is a convenient falsehood they intend to use as a false rationalization for voting against Obama. In the same breath, they also do not consider Romney to be a Christian, because he is a Mormon. However, in the case of Rmoney, they conveniently rationalize his non-Christianity as being a non-issue for them. It is also notable that the right wing nuts as a whole share a strange sort of twisted logic that they intend to vote against the POTUS, but not for Rmoney. They same goes for their illogical rationalizations, which allows them to conveniently pretend that Obama is a communist or socialist, and that he is not even a U.S. citizen. Their outrageous extremisms and falsehoods, while outrageously shocking are admittedly also outrageously funny at times too. One would have thought that the right wing nuts would have found a candidate that they actually wanted as their choice for the U.S. presidency, rather than their wing nut logic of now employing a strategy of simply voting against President Obama. But, then again, the right wing nuts often belie common sense. It perhaps for these reasons, and many other reasons, with each passing day the now emboldened right wing nuts, while in denial of non-extreme ideas and policies, seem to become even more extreme and nuttier. In the end, as for Willard Mitt Romney, the jury is still out on who he is, and what he stands for, although it a certainty that he is the champion for neither a struggling American middle class, nor the less fortunate. This is because everything that we have come to know about the real Romney, with leaks of information here and there, leads us to believe that he will be the champion of Wall Street and corporations, rather than the average American or real Americans. For now and perhaps forever, for the average America or real Americans, Willard Mitt Romney remains simply out of touch with the lives of average Americans. Photo Source: “Jon Huntsman is critical of his party and Republican candidates' foreign policy stances”, Jon Huntsman Criticizes Republican Party, Compares Actions To Communist China, Huffington Post, April 22, 2012. Recently, former Republican Party (GOP) candidate Jon Huntsman (former U.S. Ambassador to China under President Barack Obama) made an interesting comparison between the American Republican Party and China’s political system. During an event at the 92nd Street Y in New York City, Huntsman spoke candidly about his party’s flaws, lamenting the Republican National Committee’s decision to rescind an invitation to a major fundraising event after Huntsman called for a third-party candidate to enter the race. “This is what they do in China on party matters if you talk off script,” Huntsman said. The analogy with China presents a strong critique of what is wrong with the present state of the Republic Party. This Constitution, in legal form . . . it is the fundamental law of the state and has supreme authority. The people of all nationalities, all state organs, the armed forces, all political and public organizations and all enterprises and institutions in the country must take the Constitution as the basic stand of conduct, and they have the duty to uphold the dignity of the Constitution and ensure its implementation. A direct consequence in theory, practice, and ideology is that the CCP selects members of China’s national legislature, rather than by process of a national election. There are admittedly local elections for local officials or office holders. However, this is not the same as a democratically-elected legislature. A distinguishing and much-criticized characteristic of China’s one-party model of democracy, socialist democracy or “proletariat democracy” is that neither national leaders (i.e., president, vice-president, etc), nor members of the National People’s Congress (“NPC”) are subject to election to office by an electorate (i.e., the casting of votes by ordinary citizens). In China, it presents an issue of whether there is, in fact, suffrage or universal suffrage. It is sad and presents a crisis in American politics, especially for the American Republican Party and that those hailing themselves as Republicans and/or Republican Party candidates for political office. This is largely due to the reality that Republican Party candidates that continue to talk “on script” arguably challenge the Western democratic ideal (i.e., from Athenian democracy, to modern democracy or democratic forms of government). Huntsman also spoke on Sunday about his presidential candidacy, revealing that he was less than impressed by his fellow candidates when he attended his first debate in August. “Is this the best we could do?” Huntsman said he asked himself. This is a prefect example of how to construct an institution that will deny and defy all new ideas, innovations or solutions to problems. Photo Source: Amanda Terkel, Sarah Steelman, Missouri GOP Senate Candidate, ‘Not Sure’ What Violence Against Women Act Is, Huffington Post, April 23, 2012. “Everyday, President Obama and Senator McCaskill are making it harder for working mothers and women of all ages to find a good paying job. They continue to dictate to our families how they should live, stripping them of opportunities and freedom,” said Steelman. Then Steelman added that “the Senate Democrats are making the current re-authorization of Violence Against Women bill into a political football.” It is notable that she now knows the full name of the law and the Republican Party script or Republican-message of economic doom for women. It is appalling that Steelman is either clueless or in denial of the real issues, which are women’s rights, the right to equal pay for women, fair employment rights, the Lily Ledbetter Fair Pay Act, the Affordable Care Act, abortion rights, contraception, the Blunt Amendment, the Family and Medical Leave Act, Planned Parenthood, birth control, and other issues that affect the lives of women. But then again, maybe she simply does not know the names of these acts, especially the Ledbetter Fair Pay Act. Photo Source: Willard Mitt Romney and Paul Krugman, Huffington Post, April 24, 2012; See also Paul Krugman, The Amnesia Candidate, The Opinion Pages - New York Times, April 22, 2012. Then in a broader context of “talking on script,” there is the Republican Party and its GOP sure to be nominee, Willard Mitt Romney, and his handlers. Willard is leading the charge with his economic doom message. When the economy was earlier struggling more so than now, according to Willard, President Obama is doing nothing to aid economic growth, but when the economy was clearly showing upward momentum, he said President Obama is not doing enough. In answer to our problems, the fact that running a government is not the same as running a business notwithstanding, Romney wants to present the image of the savvy businessman that knows how to create jobs. His answers, however, are vague generalities about what he going to do. There are exceptions, of course, because it is clear that Willard intends to cut taxes for the wealthy; keep the credits (or subsidies) for “Big Oil”; increase spending for the Pentagon; rid the nation of entitlement programs such as the Department of Education, social security, Medicare, Medicaid, and Obamacare; and get rid of those pesky federal regulations governing Wall Street, “Big Oil”, and environmental concerns; and get rid of Planned Parenthood. None of which will promote economic growth. One reasonably suspects that Romney’s economic plan, especially given the lack of details forthcoming from him, will be a standardized-version of the Republican Party economics that got us into the current economic crisis we have been facing. In other words, Willard will stay on script. It is noteworthy that Steelman also stayed “on script.” It was obvious because when asked about an important issue concerning women’s rights (i.e., domestic violence), after regrouping she gave the stand pat Republician Party economic doom message or script. Steelman talked about women getting a job, but not about equal pay for women (i.e., the Lily Ledbetter Fair Pay Act). A new poll in the United States shows that Americans are still deeply frustrated at the slow pace of the economic recovery. That’s understandable. Unemployment stays stubbornly high. But I was just in Europe, and they think America is booming. Consider this: the U.S. economy is on track to grow between 2 and 3 percent this year. In Europe, by contrast, half the eurozone economies are going to actually shrink this year and not one major European country will grow over 1 percent…. And, most importantly, for now, it needs to stop imposing austerity in a depressed economy and learn from something from the example across the Atlantic. Two or 2.5 percent growth might not look so great in America, but it a lot better than negative 0.3 percent, which is the current estimate for the eurozone’s economic growth. In this respect, the Republican Party script promotes false perceptions about the possibility of a quick recovery. While many economists are still debating whether the 2008 global financial crisis is structural in nature and thereby predicting long term recovery, the Republican Party script stays steadfast to a false economic doom message. The Republican Party and Rmoney (Romney) will admit neither that the onset of the financial is in 2008, nor that the financial crisis occurs during the presidency of George W. Bush. For Republican Party and Republican Party candidates, it is also noticeable that keeping on script entails never mentioning the name of their former president, George W. Bush. By staying on script, despite the hazards that Republicans are encountering, as boldly asserted by Huntsman, “Gone are the days when the Republican Party used to put forward big, bold, visionary stuff.” In other words, the Republican Party script, as earlier mentioned, denies and defies new ideas, innovations or solutions to problems. What the Republic Party script offers an unsuspecting American populace is a big spoon full of the same economic policies that were the cause of the 2008 global financial crisis. When playing the devil’s advocate, if there is anything conceivably new in the Republican Party script, it can only be attributable to the saying that – the old is new again. In the end, the Republican script is about old Republican Party economics, and an earlier failed trickle down economics, which is hardly a real solution to real problems. >>See also the recent article by Paul Krugman, which follows. So am I saying that Mr. Obama did everything he could, and that everything would have been fine if he hadn’t faced political opposition? By no means. Even given the political constraints, the administration did less than it could and should have in 2009, especially on housing. Furthermore, Mr. Obama was an active participant in Washington’s destructive “pivot” away from jobs to a focus on deficit reduction. And the administration has suffered repeatedly from complacency — taking a few months of good news as an excuse to rest on its laurels rather than hammering home the need for more action. It did that in 2010, it did it in 2011, and to a certain extent it has been doing the same thing this year too. So there is a valid critique one can make of the administration’s handling of the economy. But that’s not the critique Mr. Romney is making. Instead, he’s basically attacking Mr. Obama for not acting as if George Bush had been given a third term. Are the American people — and perhaps more to the point, the news media — forgetful enough for that attack to work? I guess we’ll find out. *Paul Krugman joined The New York Times in 1999 as a columnist on the Op-Ed Page and continues as professor of Economics and International Affairs at Princeton University. . . .
Year of the Dragon – 恭禧发财! – Gong xi fa cai! Foreign Law Translations - "English translations of decisions from Germany and France"
YeeYan/译言 - "a community that discovers and translates global contents into different languages"
The Online Library of Liberty - "to encourage study of the ideal of a society of free and responsible individuals"
Short history of etymology of the word liberal: of Liber and Alis!